Hello everybody! 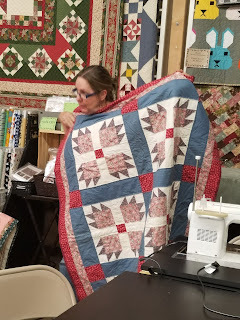 Jan normally does the meeting blog posts, but this month asked if I (Angelica Jones) could do it for her since she was out of town. So that's why it's taken a bit to be posted, my apologies. 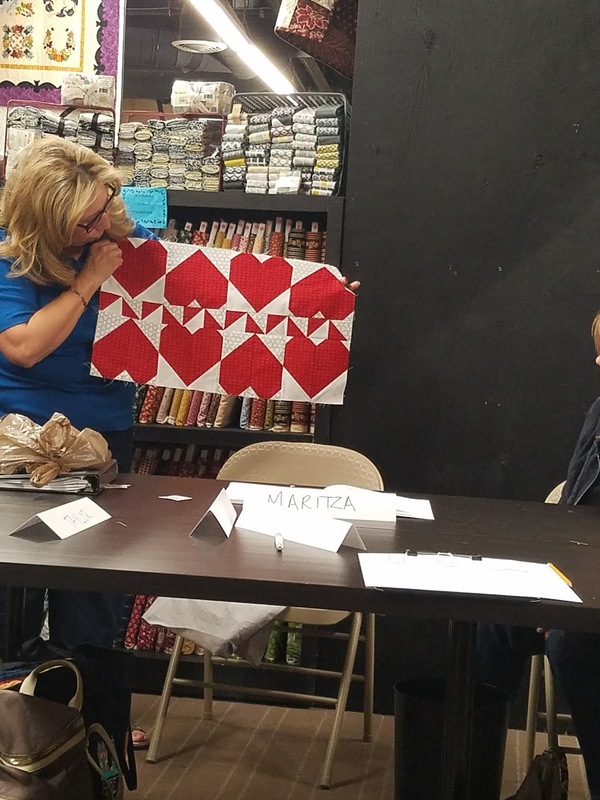 I was running late that evening because of my daughter's Open House at school, so I've also used parts of Maritza's Meeting Minutes to fill in the blanks (thanks, Maritza!). 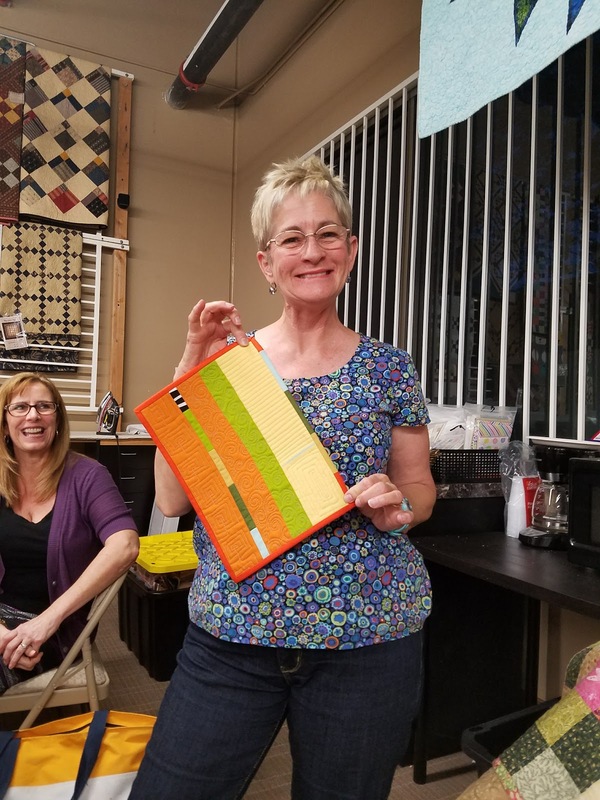 The meeting started off with Jan explaining the new raffle ticket distribution. For each meeting you can now earn up to 3 raffle tickets: 1 for coming, 1 for bringing something for Show and Tell, and 1 for turning in your BOM block to Susan. There will be 3 prizes which up for grabs, and you are free to put your tickets towards those prizes however you'd like. Jan reminded all members to create a solids quilt by the May 2017 meeting. 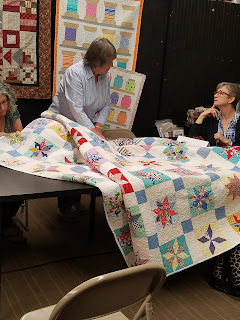 The quilt can be lap size or larger, using solids only. 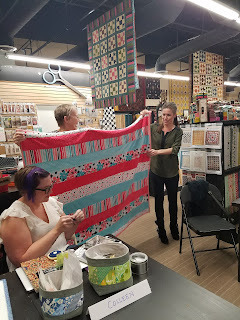 Can use an existing pattern or you can create a pattern. The next MQG Sew Day is Saturday, March 18. Please share your photos of what you are working on with the hashtag #mqgsewday on Facebook and Instagram. Jan also told everyone about a new feature on the blog which will be Member and Officer Interviews. Once a month, I (Angelica) will be emailing a list of questions out to a member or officer and then do a blog post about that person, If you would like to volunteer to be one of the first I interview, please let me know. Otherwise I will be picking them at random. Also, a Christmas in July get together is being planned for the evening of July 20th at 6:30 pm. 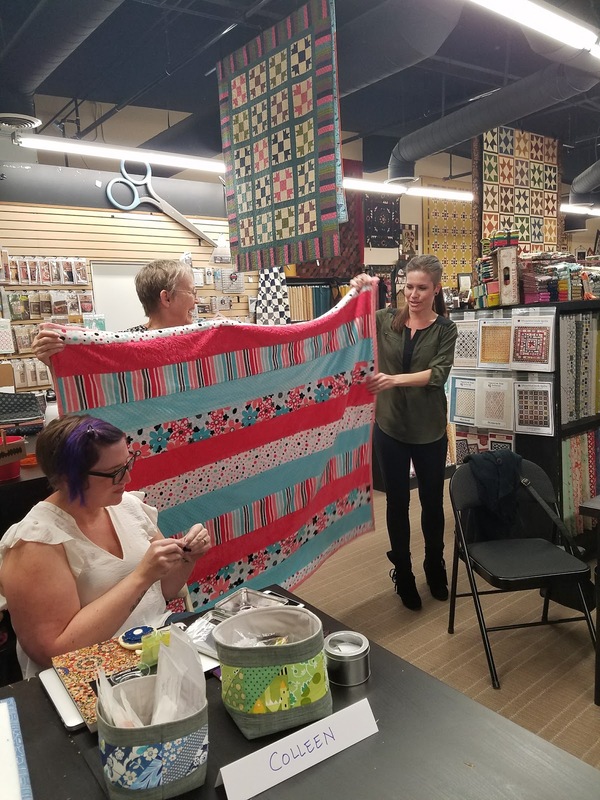 It'll be a potluck with finger foods and will include a mystery gift exchange of a hot pad or pot holder. Your exchange item will need to be brought in a brown paper bag. The hot pad or pot holder should be made with two layers of batting so it can be used safely in the microwave. An address for the event will be provided in a future email or newsletter. 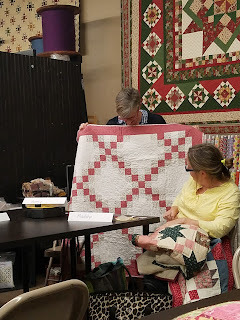 The demo for this month's meeting was English Paper Piecing (EPP) and was demonstrated by Colleen Molen. Colleen explained how to purchase and match pieces. Colleen recommended Superior Thread Bottomline, 60 wt., light gray versus white. 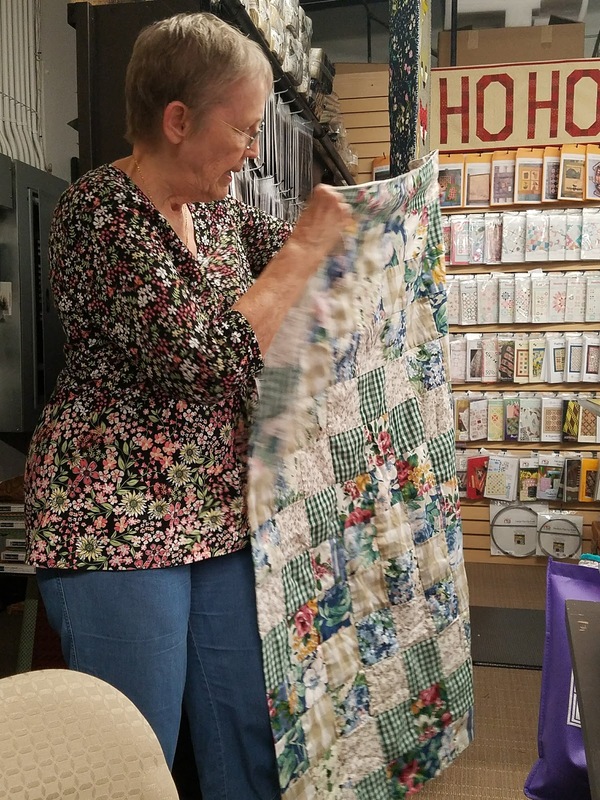 She also recommended that you run thread over bees wax to prevent tangling. Instructions on the EPP will be posted on the blog. 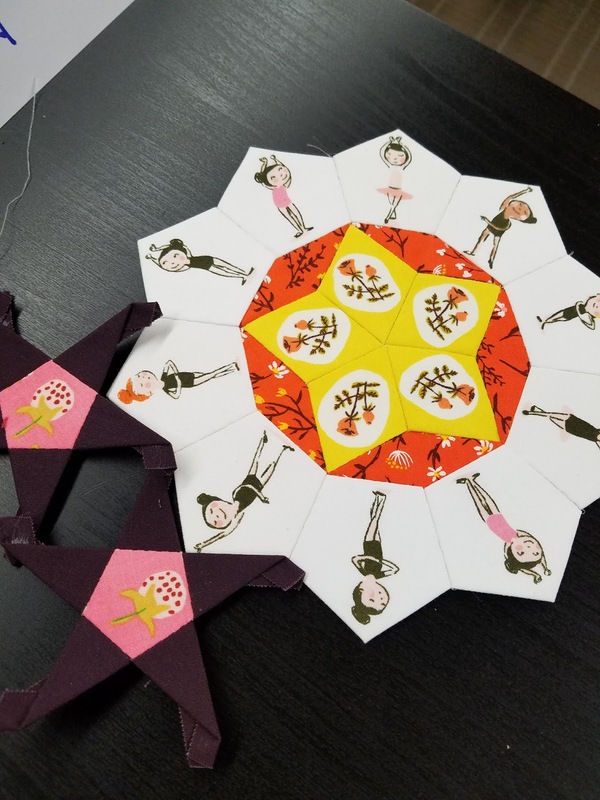 EPP paper shapes can be found on Paperpieces.com as well as at Primitive Gatherings. 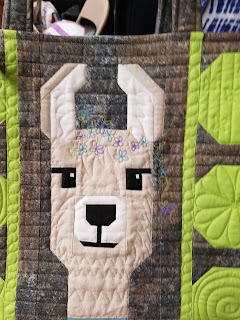 This is part of her current EPP project. Here she showed us how to baste using a basting glue, rather than a basting stitch. 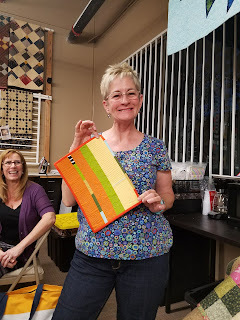 Jan presented the new block of the month for April. The instructions are up on the blog. 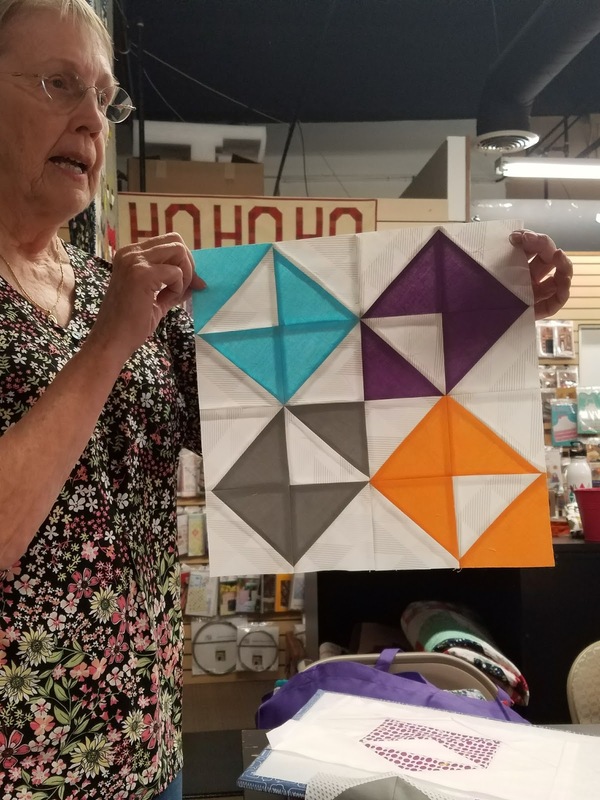 Just as the last few months, the block can be made in any color of your choice and the background fabric can be done in white or any other low volume white on white print fabrics. 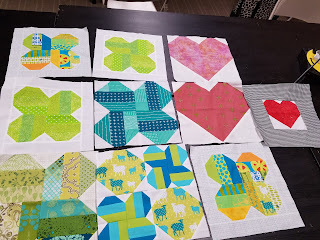 Completed blocks should measure 12.5" when done. 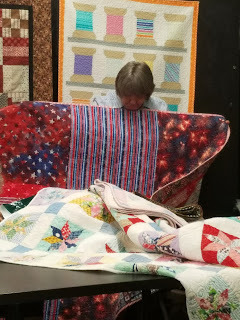 At last month's meeting, Jan asked us to gather our oldest quilts and to bring them in for this month's Show and Tell. Jan started off Show and Tell by sharing 2 of 10 quilts she made years ago using fabric samples she collected while working at a furniture store. 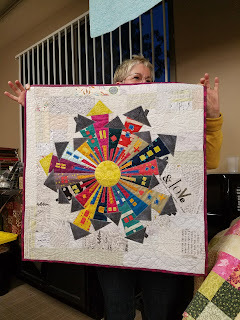 Jan also showed us her super fun Riley Blake Solids Challenge quilt. 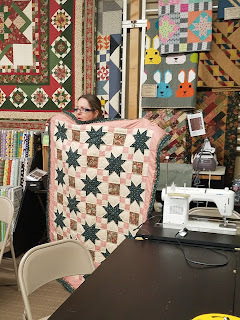 And as always, the backs of her quilts are pieced and just as fun as the tops! 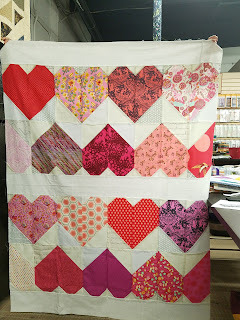 I shared next and showed my Tula Pink Paper Hearts quilt top (which I hope to get done by next meeting). 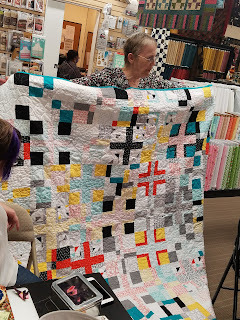 I also brought a patchwork rainbow that I made with my daughter. I'm going to teach her how to make in into a pillow cover. Susan brought in her quilt from 3 years ago. 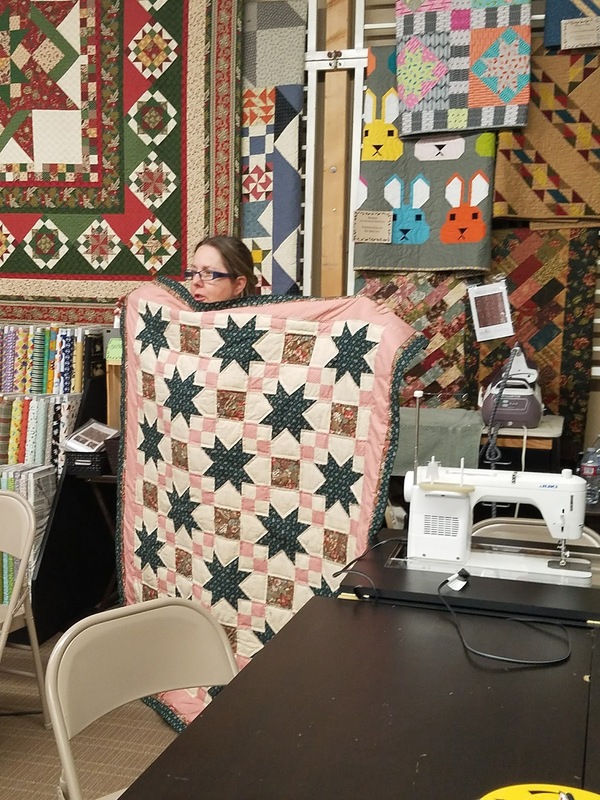 It's her second oldest quilt. Susan made this bright and beautiful house mini quilt using a dresden template. She patchworked various low volume fabrics for the background. 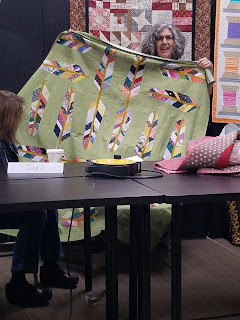 She also made this improv wall hanging and improv mug rug. 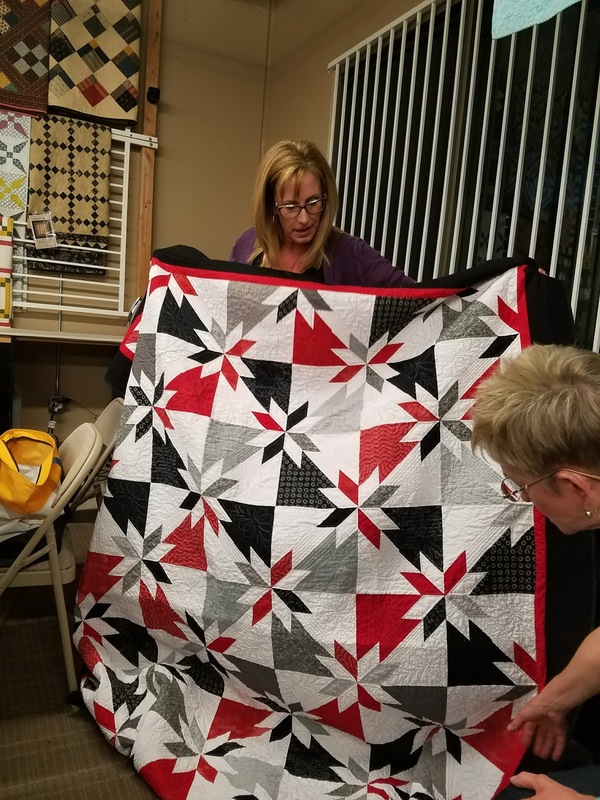 Sue brought in her firefighter quilt she made for her middle son. This was the 2nd quilt she has machine quilted on her own. Madelyn brought in a quilt from 1988 which she quilted mostly by hand. 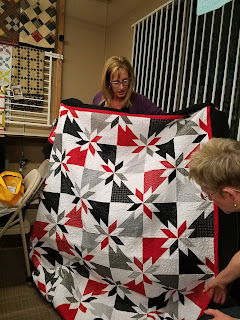 She made her second quilt in 1990. 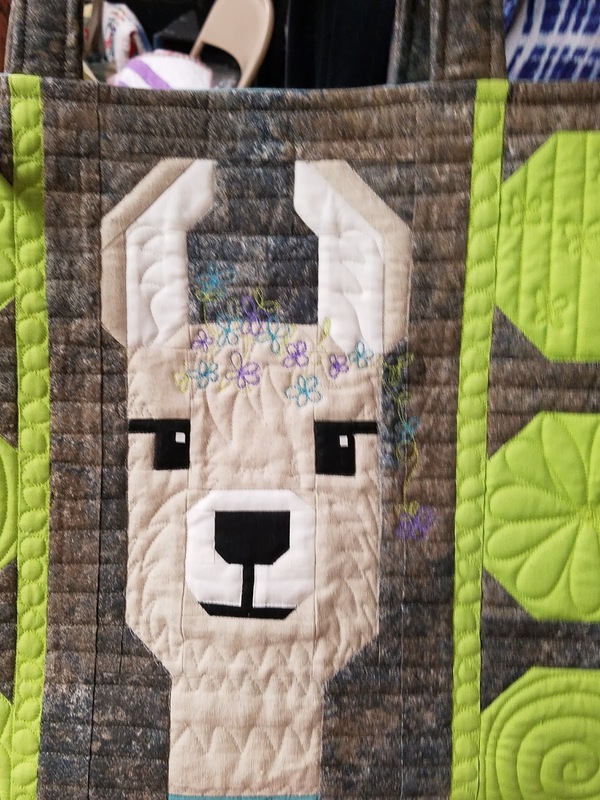 This was was also mostly quilted by hand. 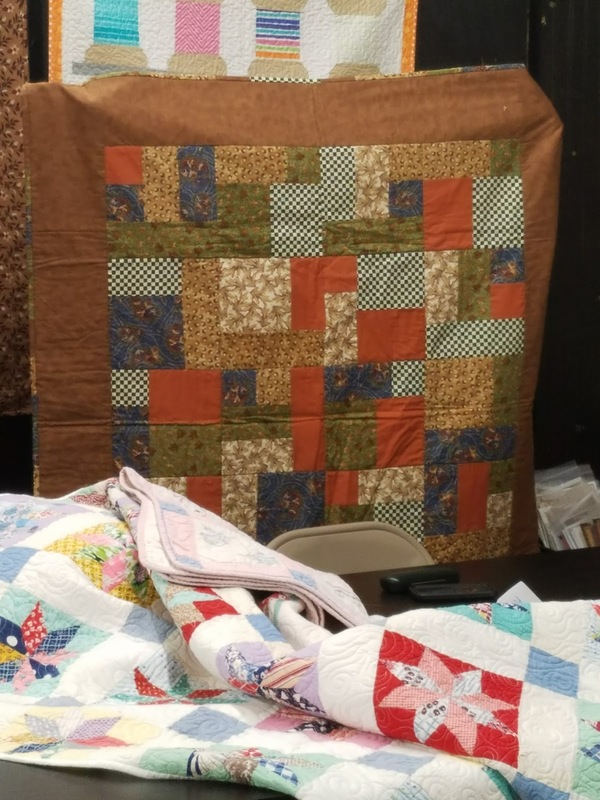 Nancy brought in her quilt from the 90's. 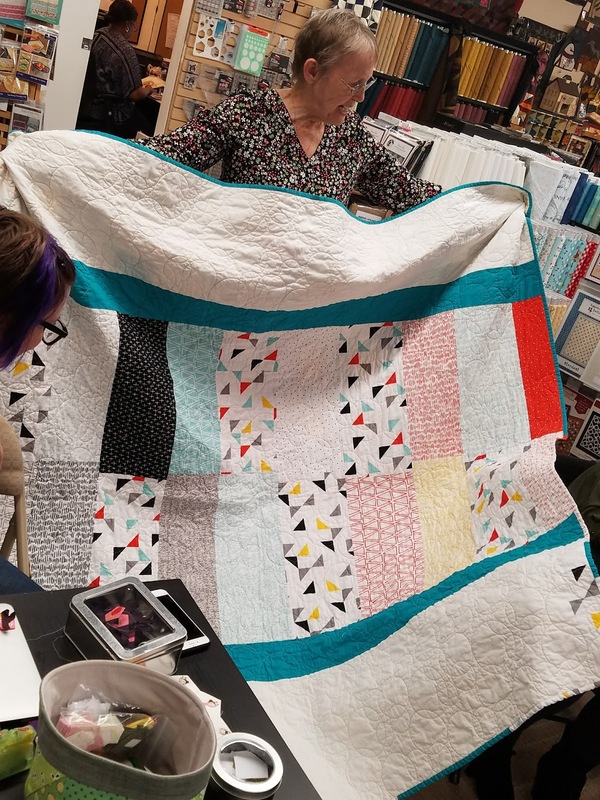 It was her 2nd or 3rd quilt. 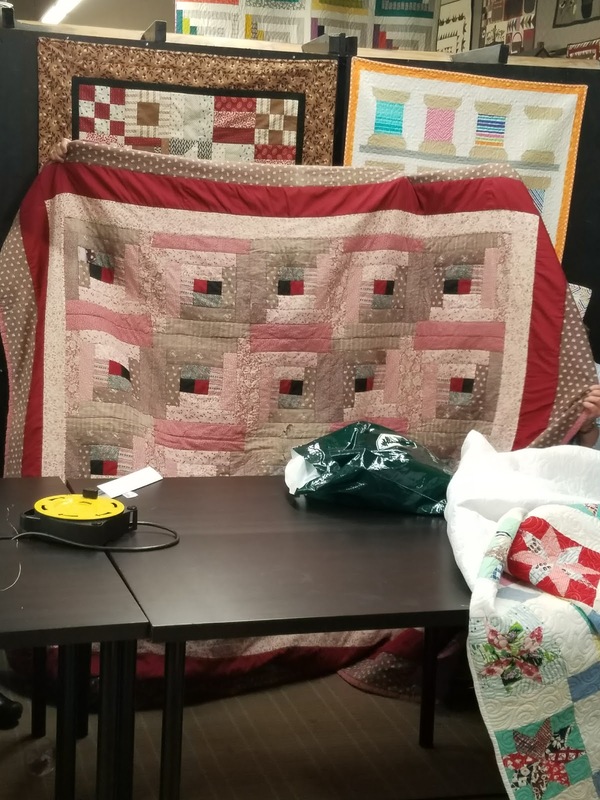 This was a log cabin variation baby quilt she made. 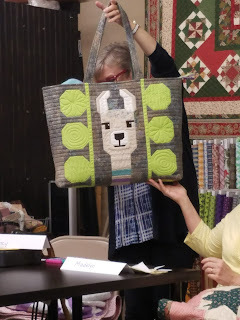 She also made this darling llama bag and even added embroidered flowers on its head. 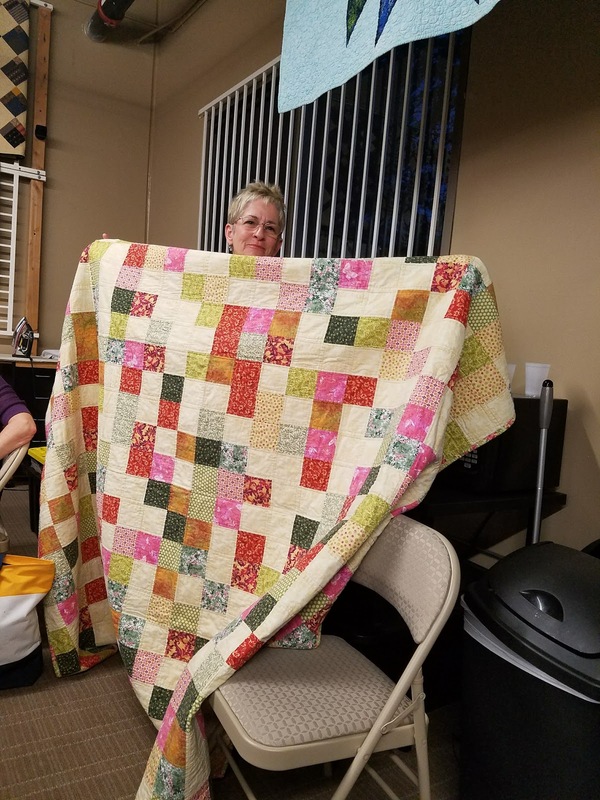 Linda got this quilt top from the free table at her old guild. 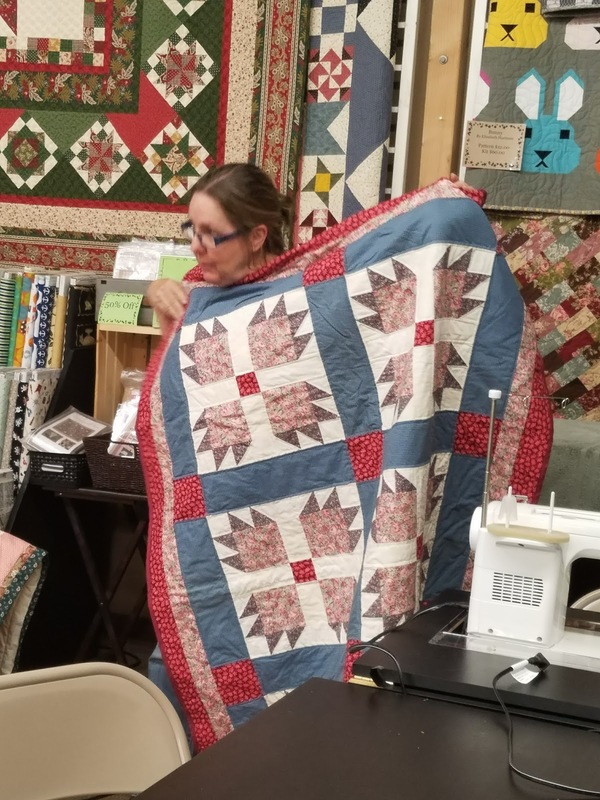 She repaired it and quilted it. This quilt was her own baby quilt which was pieced by one of her grandmothers and quilted by her other grandmother. Linda's oldest quilt was made about 10 years ago. And this 4th of July quilt was the oldest quilt she started. 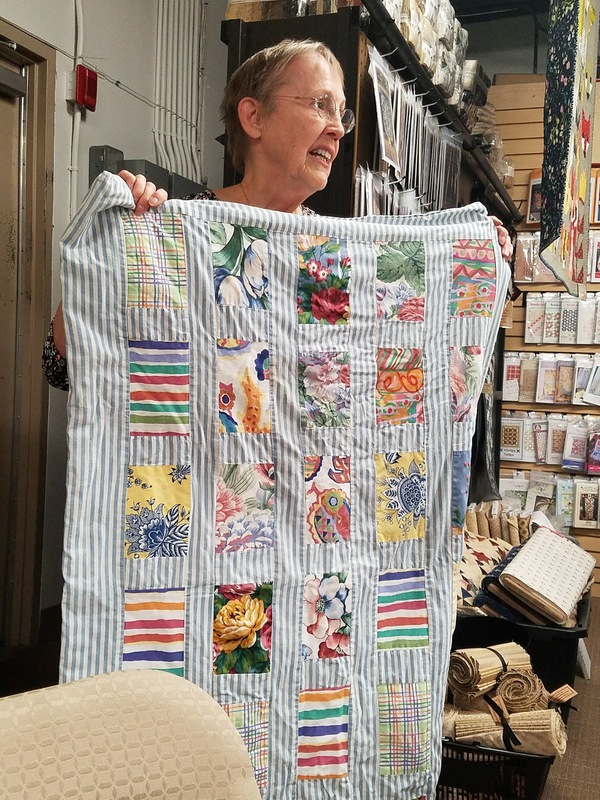 Patti brought in her oldest quilt from 1978. 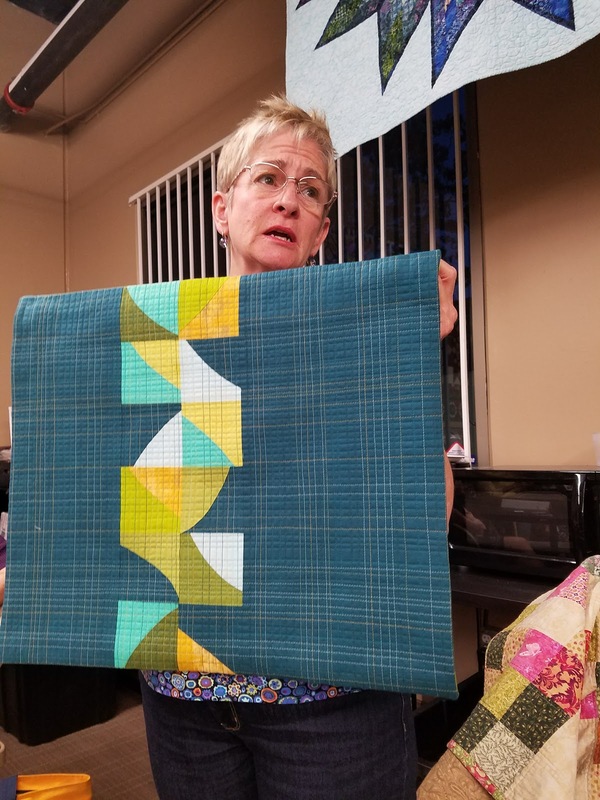 She used a quilt as you go pattern. 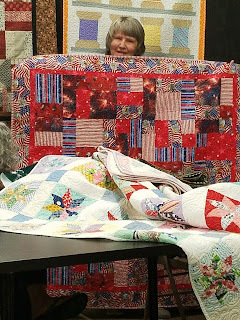 Patti's most recent quilt top is her Feather Bed Quilt, pattern by Anna Maria Horner. 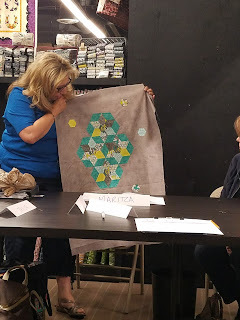 Maritza showed us her EPP applique wall hanging quilt top. 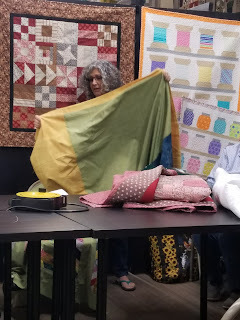 She learned the EPP technique during November's workshop which was led by Colleen. 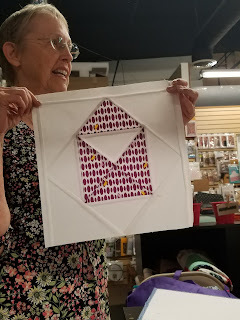 She started a table runner using February's BOM heart pattern. 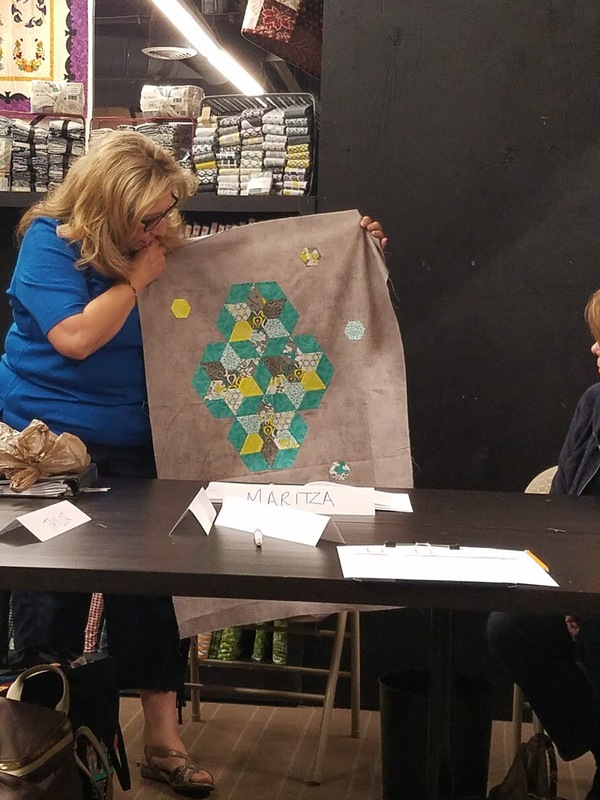 Maritza completed her first quilt in 1990 in a class. 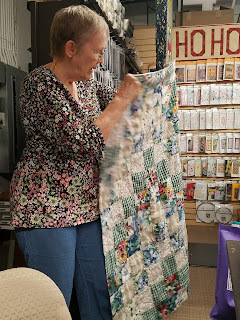 It was hand pieced and quilted, she learned fabric color values as part of the process as well. 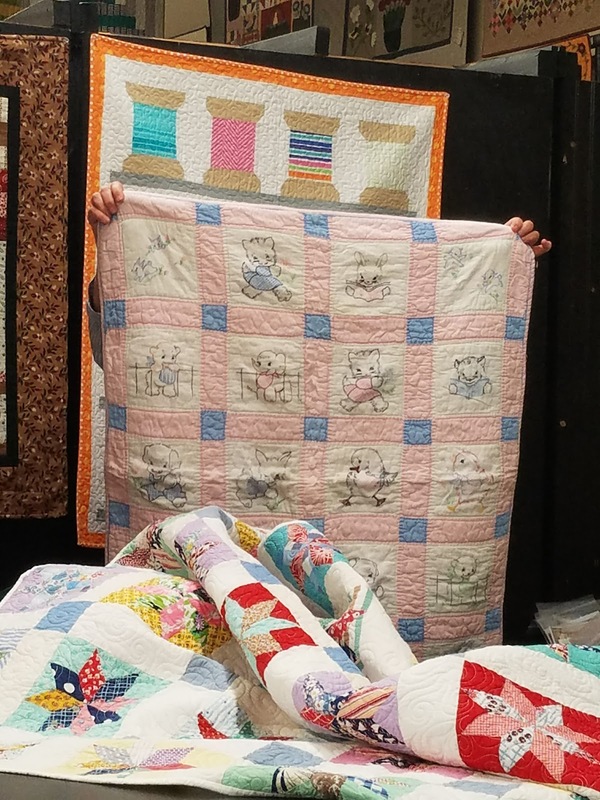 This quilt was her 2nd quilt which she made in March of 1991 for her daughter. Her family lovingly calls it the "Puppy Quilt". 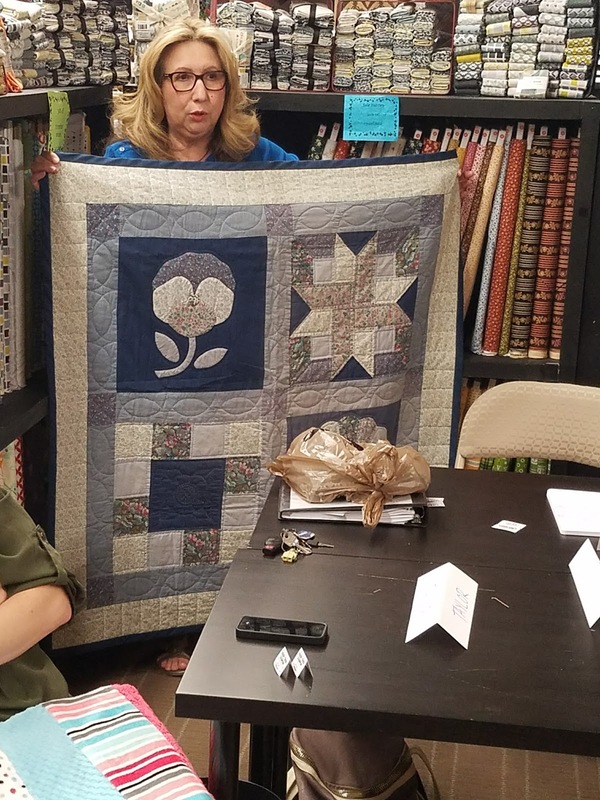 Taylor brought in the 2nd quilt she ever made (since she gave away her first). She made this one with her mother in law while she was pregnant. 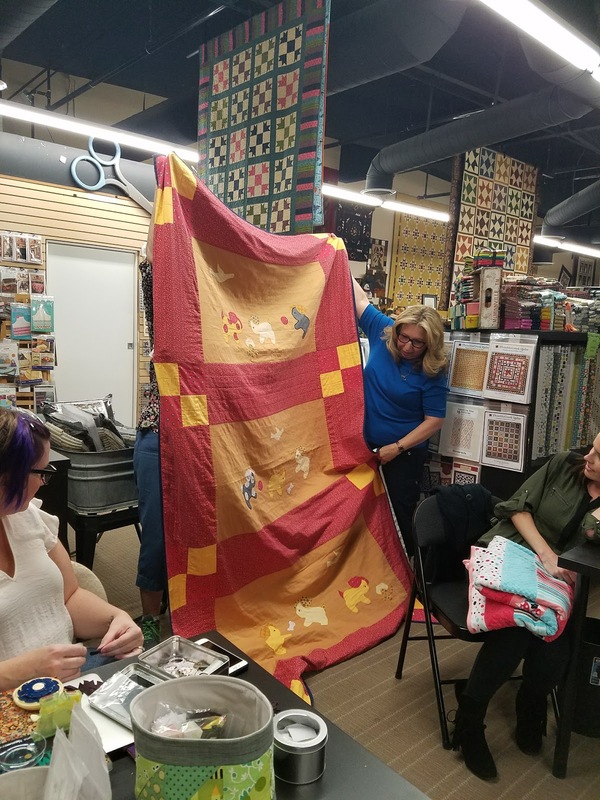 It was backed by a soft minky fabric. Here are the blocks we collected for the BOM. It was the 4-leaf clover for March. 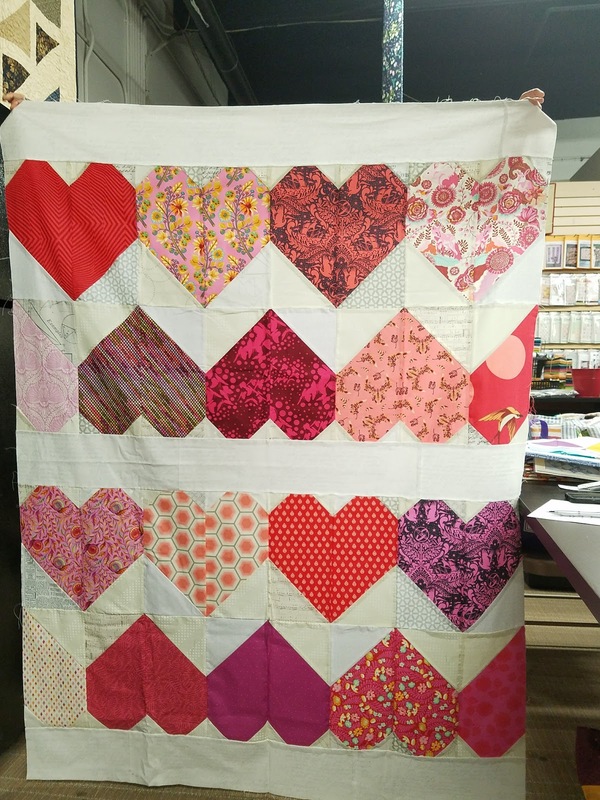 We also collected a few more hearts from last month. 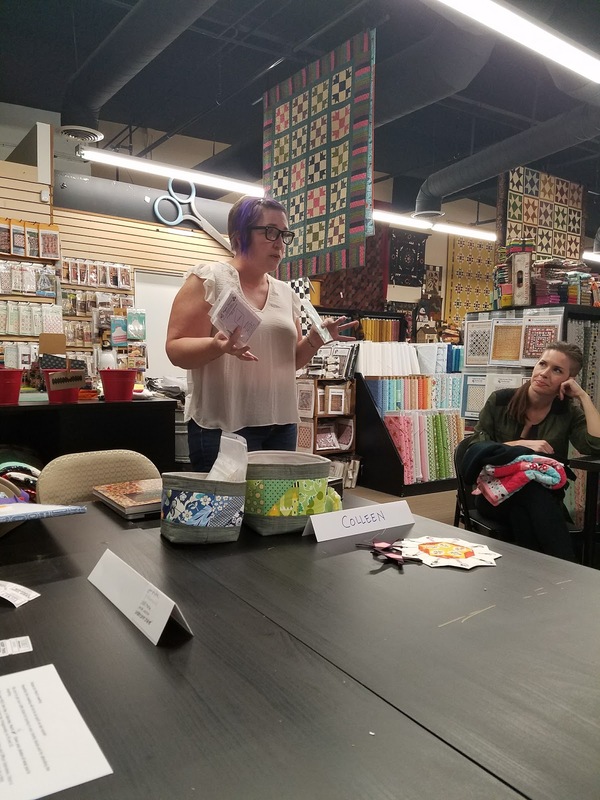 At the end of our meeting, we picked winners for our raffle prizes. The winner of the Quiltcon bag, MQG water bottle, and 2 fat quarters of Libs Elliot's new "Tattoo" line was myself, Angelica (which I was SO excited about!!!). The winner of the $20 Primitive Gatherings gift card was Madelyn. And the winner of the Layer Cake of fabric was Linda. 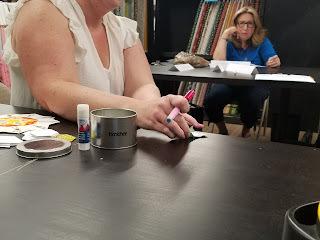 As you can see, this month's meeting made up for the very short meeting we had last month. Next month's meeting will be on April 20th at 6:30 and will be led by Jessica since Jan will be gone on vacation. 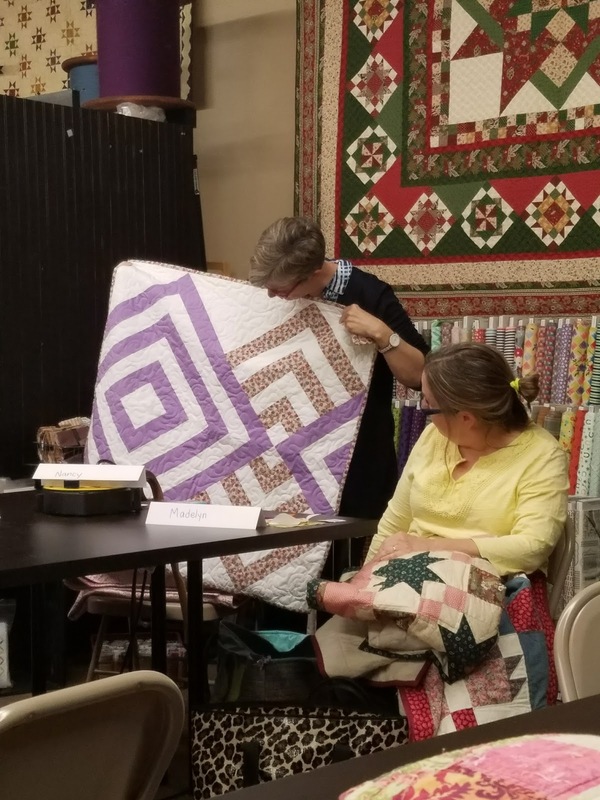 Be sure to join us for a fun demo, new block of the month, and to turn in your BOM blocks from this meeting (see BOM tab for details). Hope to see you all! It's taken awhile, BUT our Lending Library is open. Jessica compiled a list of the books and one magazine that are available to check out. Just click the tab that says Lending Library to see what's available.